A Star Note is a bank note with an asterisk (*) or star placed before or after the serial number. The Bureau of Engraving and Printing (BEP) uses replacement Star Notes when a bill is found defective during printing. These error notes are replaced with Star Notes . A Star Note is used because no two bills can be printed with the same serial number in a series. The bureau can keep an accurate count of bills printed in each serial number run by using Star Notes. On Federal Reserve Notes, the star is where the block letter or last letter of the serial number is. 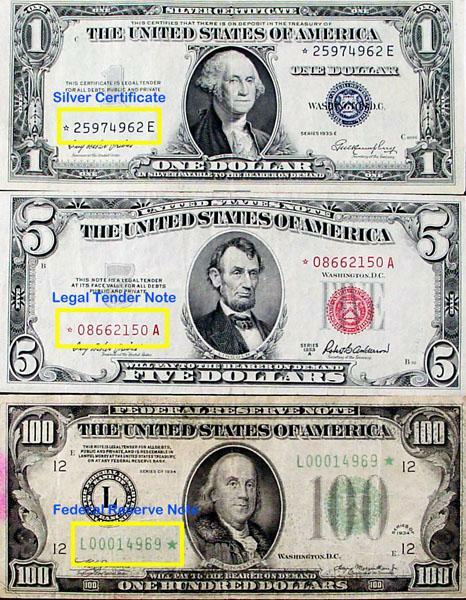 On Legal Tender Notes and Silver Certificates, the star is where the pre-fix or first letter of the serial number is. Star Notes were also used for the 100,000,000th note in a series. This was the last note in the block of serial numbers. The numbering machines could not print over 8 digits. Star Notes are no longer used for this. Now the highest range of serial numbers are reserved for uncut sheets sold to collector's. Regular notes printed for circulation do not reach this number in the block. The rarity of Star Notes depends on on the "run" size. This determines the number of notes that are printed and released into circulation. The BEP currently prints Star Notes in maximum runs of 3.2 million. This is 100,000 32 note sheets. The runs are smaller depending on how many Star Notes are needed. The smaller the run the more rare the Star Note is. Collectors consider a run of 640,000 notes or less rare.